Since the unsubbed version is already out on CrunchyRoll, it won’t be long before every HanaKimi fans will get access to watch the 90 minute special. With multiple midterms this week, it took me a couple days to finish the movie special. The special basically revisits our favorite people from the Hana Kimi (Japan) series but doesn’t develop the plot at all. We see Nakatsu being his happy/over-active self and Sano expressing… what is that? His emotions!?!! The boys at the 3 rivial dorms are still acting as silly as ever, and sports is still the only clue that school is in session. Do they not have class? The only adults at the school seems to be principal, her assistant, and the homosexual nurse. The special wasn’t bad at all. It’s just a little disappointing after that long wait and all the hype from the media. Watch this! I’ve only seen the first episode and am super excited for the rest. For those of you who haven’t heard of Koizora, it’s a super cute story about high school romance. Some dialogues are pretty mushy but nothing out of the norm in a jdrama. This is not the 2007 movie but actually a very short drama – six episodes total – airing August to September 2008. [Later… Same day] Lol, I’ve finished the three episodes that have aired! If you think this drama is too immature or mushy for you, stick it through the first 2 episodes. Trust me it gets a lot more interesting and much more emotionally gripping. So many tragedies happen to the unlikely couple of Mika and Hiro, I can’t help but be amazed that they make it through it all. I won’t speak too early since a lot could happen in the second half / the last 3 episodes. I hope they make it. Mine and everyone else’s most anticipated drama starts airing July 27th! Starring three of the hottest stars in Taiwan. I sure because Jerry Yan (of F4) and Wu Chun (from Fahrenheit), the show will be a big hit in much of Asia. Here are videos of the 5 minute preview and the opening theme. I’m expecting Jerry to be amazing. He has the most experience but all three male leads are known to be very hardworking. That’s how they got to where they are now right? Hardwork and good looks. I’m not too familiar with the female cast. Coco is known in the modeling world and I’ve seen her on talk shows like KangXi. Both leading ladies have made very few drama before, none of them well-known. I hope they hold their own on the screen. Now that I’ve finished all 50 episodes and am at a lack things to do, I’ve decided to write down some of my reflections on the 2008 version of LOCH. Let me know if you agree or disagree! The original plot of the book is worshiped by generations of readers of Wu Xia novels. The new version has a couple of twists to keep everyone interested. Also, the 2008 production has a cast targeting a younger audience (i.e. 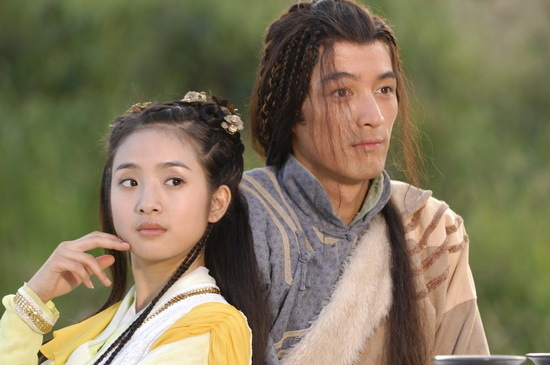 Hu Ge and Ariel Lin). The long history of the dynasties and fueds, that cover a good deal of Jin Yong’s novel, are quickly covered in the first couple of episodes. A big ‘Thank You!’ to the director and screenwriter. Huge changes were also made for the character Yang Kang but you’ll have to scroll down to the spoilers section to read about the specifics. As for casting for the four lead character, I have some accolades and some grievances. 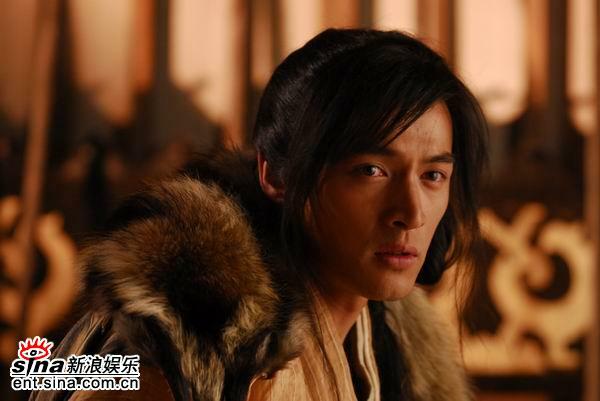 I really appreciate that the 2008 version has the hottest Guo Jing to date. His first appearances, mostly his hair, has the viewers (including myself) questioning the costume director. Please get that dreadful curtain of frizzed bangs away from Hu Ge’s gorgeous face! However, his lookdoes improve significantly in a couple episodes of part 2 of LOCH. He even picks up a cute unshaven look near the end. Part 1 of the LOCH left us at a somewhat comedic cliffhanger – watch the end 26 episode and you’ll see. Is Guo Jing going to win the hand in marriage of his beloved? After days of waiting and googling, I’ve found that part 2 has finally started airing and therefore can be found online. (Look below for a list of links.) 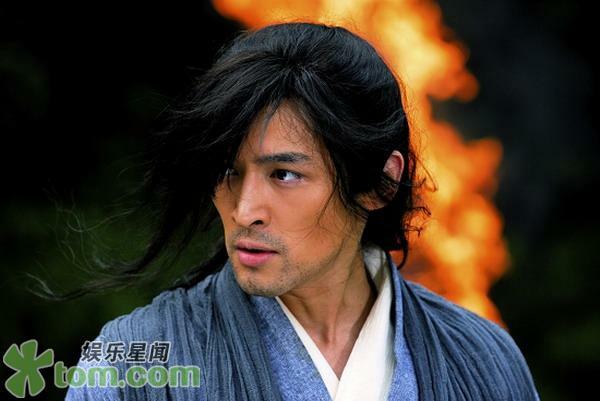 I’m expecting a lot more action and waiting for Guo Jing to comb his hair. From the screencaps below, you can tell that his hair is going to get better. He’s also loosing that innocent/mentally retarded look. Hopefully, Guo Jing keeps his dumb luck since stronger enemies are showing their faces in part 2. If you can’t get enough of Hu Ge and Ariel Lin, try watching 天外飛仙 (Tian Wai Fei Xian) where they first played a lead couple together. Normally I hate violent dramas. I still do and this drama is probably 60% extraneous fight scenes. Even as I’m skipping through the episodes like crazy, I’m still absolutely addicted. (Now you know my secret to finishing dramas in a couple days!) Ariel Lin makes the most adorable beggar I’ve seen. She’s the main reason why I notice such a violent drama. Also, the name 射雕英雄传 (Legend of the Condor Heroes) is no stranger amongst the Chinese because of the success of the books that this drama is based and named. Lastly, the main character Guo Jing (played by Hu Ge) is very lovable – the epitome of a stupid but courageous good guy. He tends to be very lucky in bad situations too. He’s basically a character that you never need to worry about dying in the numerous violent scenes in each episode. Basically all the people he cares about will probably die one by one before he gets anywhere near injured. Maybe I speak too early since I’ve barely started the drama. There’s 26 episodes that’s in part 1 and who know how many in part 2. [Updated 07/19/08: There are 50 episodes total released in 2 parts.] Totally recommend this drama. I should really post some other good Chinese dramas since there’s aren’t that many compared to J, K, Tw.